The Photonics Explorer is an intra-curricular educational kit designed to engage, excite and educate students about the fascination of working hands-on with light and optics in the classroom. The kit was developed within an EU project. Since November 2011, EYESTvzw is responsible for the assembly and mass distribution, and for supporting teachers in our endeavour to convey the fascination of science and engineering to pupils. The aim is to inspire the next generation of scientists and engineers by distributing Photonics Explorer kits. Girls are communicating with light at a workshop in the Atomium. Credit:EYEST vzw. EYESTvzw is a Belgium based non-profit organization established in November 2011 by members of the Brussels Photonics Team of the Vrije Universiteit Brussel. The sole mission of EYESTvzw is raising interest of youth in Engineering, Science and Technology through creation and dissemination of educational programs mainly to schools. The development of EYEST’s educational programs is financially supported by sponsoring companies and governments, and made available to teachers, students and schools. EYESTvzw is currently responsible for the fundraising for, and the assembly of, the Photonics Explorer kit as well as for its distribution throughout Europe. To organise the distribution all over Europe, EYESTvzw works together with very motivated partners in several European countries. Local Associated Partners are responsible for the teacher trainings and the distribution of the Photonics Explorer in a particular country or region. In the framework of the European project LIGHT2015, EYESTvzw had the opportunity to introduce the use of the Photonics Explorer as an educational tool in a number of countries where it was not already represented. Ten new local associated partners received a training with practical information about the kit and its content and best-practices on how to organize a training session for teachers. In total, 23 trained local associated partners are transferring their acquired skills to teachers and distribute photonics explorer kits in their regions. 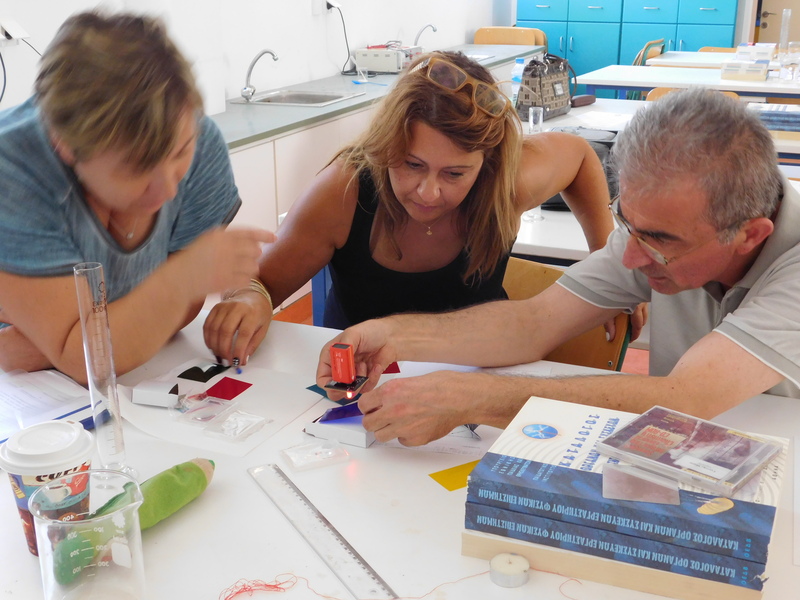 Teachers learn how to work with the Photonics Explorer kit in Greece. Credit: EYEST vzw. Each partner has their own reason to actively participate in the Photonics Explorer program. “Finland has completed the reform of the National Core Curriculum for basic education and is completing it for general upper secondary education. Schools will start working according to the new curricula in autumn 2016. The new core curricula emphasize, among other things, collaborative learning and linking school science to students’ everyday life. In the science subjects students are encouraged into collaborative innovation processes and applying their knowledge in practice. Therefore, Photonics Explorer kit is a great tool for Finnish physics teachers to implement Finland’s new core curricula. Together with its Local Associated Partners EYESTvzw will at least distribute 2015 Photonics Explorer kits in IYL 2015, to engage, excite and educate at least 100,000 students every year! By proclaiming 2015 as the International Year of Light and Light-based Technologies, UNESCO recognizes the importance of light technology as a source of sustainable development and scientific innovation. In this framework, the Brussels Photonics Team (B-PHOT) of the Vrije Universiteit Brussel (VUB), Belgium’s national contact point for IYL 2015 and partner in the European outreach project GoPhoton!, has taken several initiatives to create awareness about photonics. One of the examples is the exhibition ‘ID#2015: Discover the power of Light!’ in Brussels, Belgium. 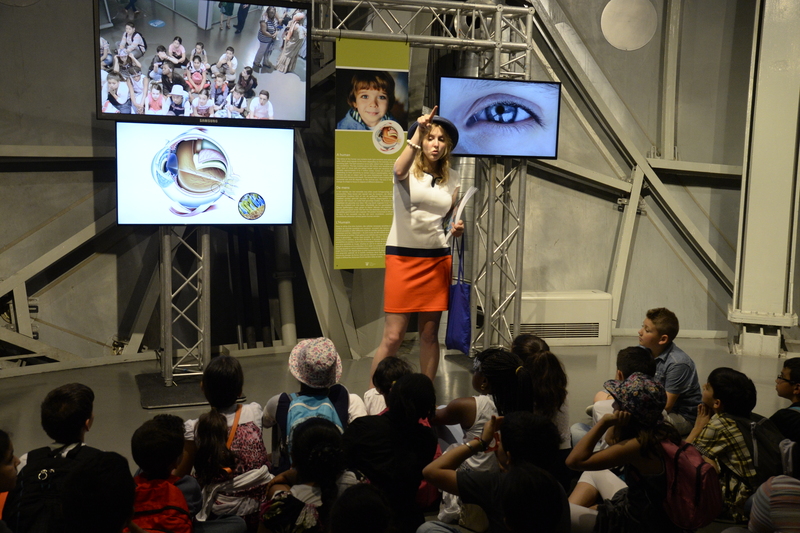 Young minds visit the exhibition: “Discover the power of light!” at the Atomium. Credit: EYEST vzw. This informative, visual and lively experience-exhibition, located in the nation’s illustrious national monument the Atomium, spreads the positive message of durable light technology for a better world. The exhibition immerses the visitors in the fascinating world of light phenomenon and light technology. In different areas in the Atomium the visitors learn how important light is in present-day life through a total light experience supplemented with sound, 3D effects and optical illusions. Since the beginning of June we have already welcomed more than 200,000 visitors. Until 18 October 2015, the temporary exhibition in the Atomium is dedicated to the power of light! Teachers are always looking for challenging and interesting activities for their students. B-PHOT responds well to these questions. For example, we are organising several workshops in the Atomium in combination with a guided tour in the exhibition. 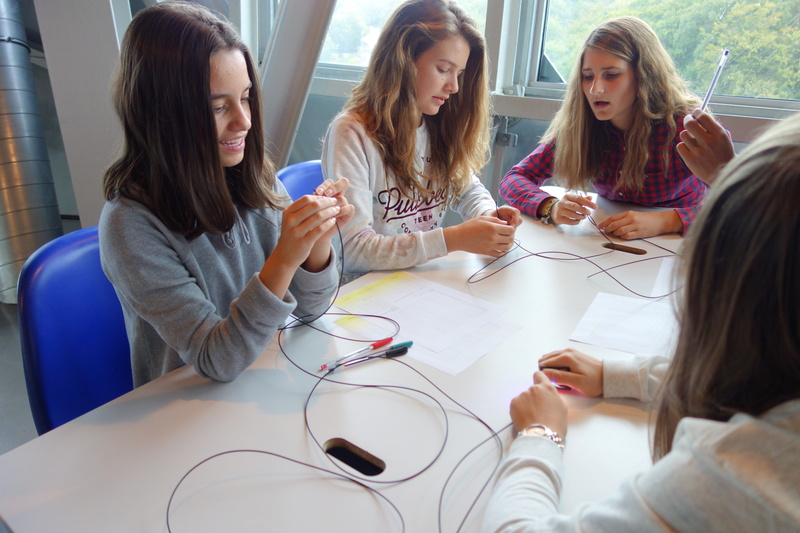 During five Mondays in September and October, we will welcome nearly 200 pupils and immerse them in the mysteries of polarization, light communication, interference and light painting. Also B-PHOT’s science show ‘Photonics, the technology of light is already fully booked. On 26-27 October more than 1,500 students will be introduced to solar energy, lenses, the creation of light and much more. B-PHOT will also organize a Girls&Boys congress for the first time. During this congress, many young people will make solar boats or art with polarization, visit labs or learn to work with the apps of GoPhoton! In B-PHOT, we clearly believe in investment in outreach to benefit the world of Photonics! Nathalie Debaes (left) and Tine De Pauw (right) work at the Brussels Photonics Team at VUB, Vrije Universiteit Brussel, on outreach activities and EU-funded projects. They work on the realization of the ‘Science Show’ and the exhibition ‘Discover the power of light’. 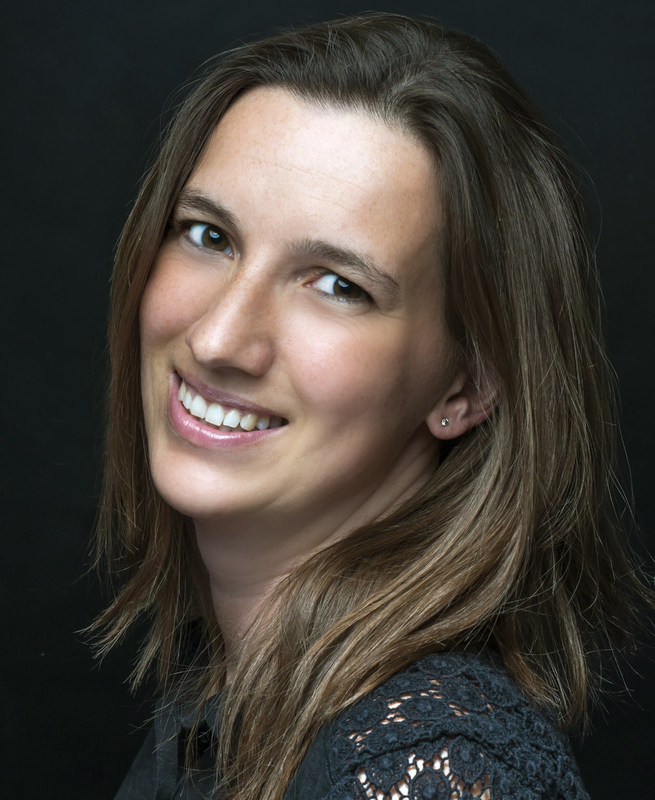 Nathalie is founding member and CEO of EYESTvzw. 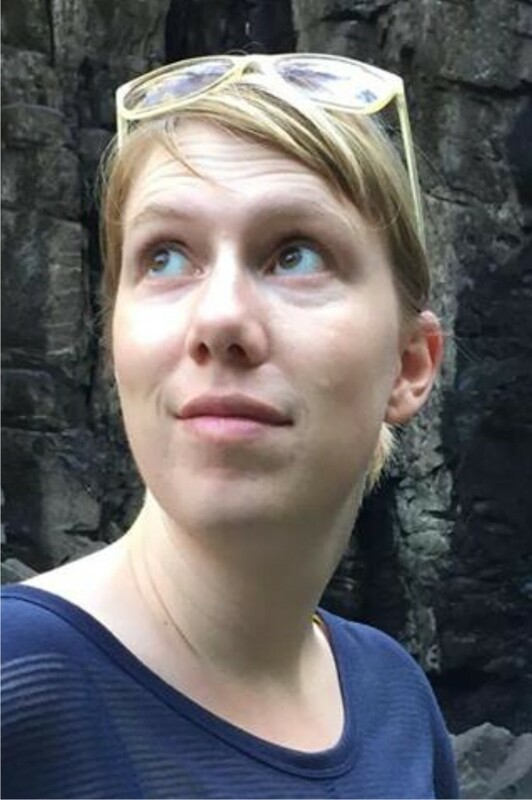 Tine helps in the Photonics Explorer programme and in the organisation of a large variety of workshops for trainers, teachers and students. They both are actively involved in the European projects Gophoton! and Light2015.